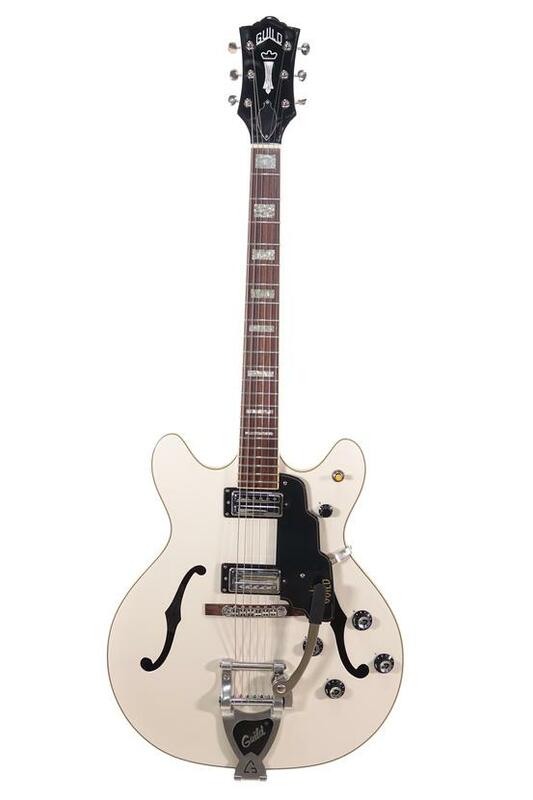 Guild Starfire V Semi-hollow body electric guitar featuring a deluxe double cutaway. This gorgeous guitar is in excellent condition, showing minor signs of general wear from previous use. This guitar arrives packaged in it's factory hard case. Semi-hollow body. A deluxe double cutaway loaded with features that give a fully expressive voice to your individual playing style. The classic Guild Starfire V is a semi-hollow beauty with a graceful 16 3/8″ thinline body and twin Guild LB-1 “Little Bucker” pickups that make it an outstanding choice with an authentic Guild voice perfect for rock, blues, roots and more. The Starfire V’s all-mahogany body features an arched top and back, with dual f holes, elegant ivory white body binding, black/white purfling and center-block construction. Other premium features include bound three-piece mahogany/maple/mahogany neck with vintage-style “soft U” profile, 22-fret rosewood fingerboard with 9 1/2″ radius and pearloid block inlays, three-way pickup selector switch, individual volume and tone controls for each pickup and master volume, Tune-O-Matic bridge with rosewood base, Guild vibrato tailpiece, Grover Sta-Tite™ tuning machines, nickel hardware.